Elizabeth Gilbert: Curiosity and the Great Passion Fallacy. [Best Of Episode] Elizabeth Gilbert exploded into the public’s consciousness in 2006 with the release of her mega-bestselling memoir, Eat Pray Love. Since then, she’s published a series of books, given a TED talk on creative genius that’s been viewed more than 10 million times, become a leading voice on the pursuit of a creative, connected and vital life. 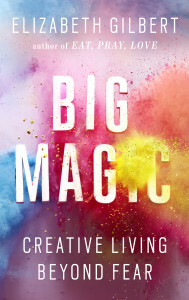 Gilbert’s book, Big Magic: Creative Living Beyond Fear, takes you deeper into what it means to live a creative life, offering a wonderful blend of wisdom, unabashed magical thinking, amazing stories and a whole lot of unexpected myth-busting and contrarian insights. I had a chance to sit down with Liz and, as often happens with these Good Life conversations, we ended up going all sorts of places I’d never planned. We touched on the power of curiosity and the fallacy of passion, where creativity comes from, what stops us from doing the thing we’re here to do, the importance of caring for your vessel, what happens when you think you’ve reached the end of your capacity and her powerful lens on what it means to live a good life. “When you come to the end of yourself is where all the interesting stuff starts.” Tweet this. If you’ve ever wondered how to step into a creative life, how to get that thing in your head and heart out into the world, this is an absolute “do not miss” conversation. We first aired this conversation in September 2015. We’re so excited to share this timeless “Best Of” episode with you today. Wondering what’s for dinner? Blue Apron is the #1 fresh ingredient and recipe delivery service in the country, whose mission is to make incredible home cooking accessible to everyone. Check out this week’s Blue Apron menu and get your first THREE meals FREE—WITH FREE SHIPPING—by going to blueapron.com/goodlife. Are you hiring? Do you know where to post your job to find the best candidates? Unlike other job sites, ZipRecruiter doesn’t depend on candidates finding you; it finds them. And right now, my listeners can post jobs on ZipRecruiter for FREE, That’s right. FREE! Just go to ZipRecruiter.com/good. Get paid online, on-time with Freshbooks, a cloud accounting software that makes it insanely easy for freelancers and professionals to get paid online, track expenses and do more of what you love. Get your 1-month free trial, no credit card required, at FreshBooks.com/goodlife (enter The Good Life Project in the “How Did You Hear About Us?” section). Hey, Listeners! We want to get to know you better! Good Life Project is conducting a quick survey with our friends at Wondery. It only takes a few minutes of your time and you can do it straight from your smartphone. Help us out and support the show by going to wondery.com/SURVEY.